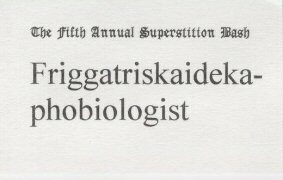 This made-up term translates as "one who studies the fear of Friday the Thirteenth"-a role subsumed under the broader term Superstition Expert. Shown here is a badge I wore for one Center for Inquiry "Superstition Bash"-such always being held on a Friday the Thirteenth. 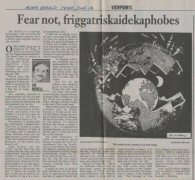 Also shown is my article, "Fear not, friggatriskaidekaphobes," which appeared in the June 13, 1997, Miami Herald.